236 pages | 23 B/W Illus. 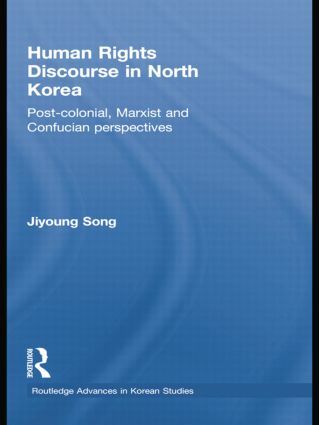 This unique book examines the conceptual development of human rights in North Korea from historical, political and cultural perspectives. Dr Jiyoung Song explains how North Korea has understood the concepts of human rights in its public documents since its independence from Japan in 1945. Through active campaigns and international criticism, foreign governments and non-governmental organisations outside North Korea have made numerous allegations of human rights violations. On the other hand, the efforts to engage with North Korea in order to improve the human rights situation through humanitarian assistance and to understand how North Koreans interpret human rights are often overshadowed by "naming and shaming" and "push-until-it-collapses" approaches. Using close readings and analyses of the collected works of Kim Il Sung and Kim Jong Il, North Korea’s official newspaper, Rodong Sinmun, as well interviews with North Korean defectors and diplomats in South Korea, China and Europe, Dr Song gives thought-provoking and highly debatable accounts for the historically post-colonial, politically Marxist and culturally Confucian elements of North Korean rights thinking. As a piece of research on a nation shrouded in mystery this book will be essential reading for anyone researching human rights issues, Asian politics and international relations. Dr Jiyoung Song is a research associate at the Centre on Migration, Policy and Society at the University of Oxford, UK, and consultant for the UN Office of the High Commissioner for Human Rights.